Restore elasticity and diminish wrinkles with this anti-aging serum that supports collagen regeneration and treats dry skin with a luxurious gold flake formula. This serum is made with Argan oil with 24K gold. Argan oil is light, luxurious and non-comedogenic oil (which means it won't clog pores). You can use it as a daily moisturizer - Just 3 drops per day is enough for an entire face. The gold is included to reverse cell damage and improve skin's elasticity, leading to supple, prismatic skin. 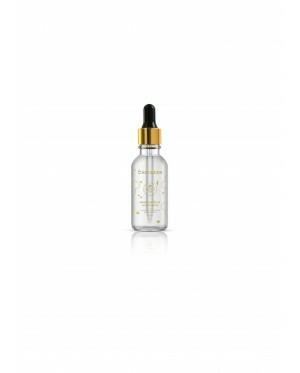 This serum is made with Argan oil with pieces of genuine 24 karat gold. Argan oil is light, luxurious and non-comedogenic oil (which means it won't clog pores). You can use it as a daily moisturizer.